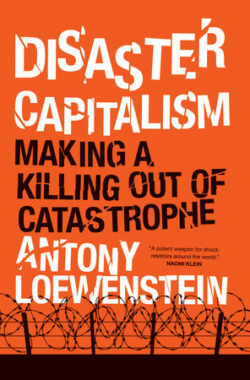 We spend the hour with journalist Antony Loewenstein talking about his book (and forthcoming movie) Disaster Capitalism: Making a Killing out of Catastrophe. It’s a powerful indictment of the burgeoning global industry of profiting from the misery of the world’s most vulnerable citizens through privatizing basic goods and services when disaster strikes. The term “disaster capitalism” was coined by Naomi Klein in her book The Shock Doctrine. It’s about profiting from catastrophe, leaving the victims even worse off than they were before disaster struck. Freelance journalist Antony Loewenstein delves deep into this apotheosis of the predatory corporatocracy in his new book, Disaster Capitalism: Making a Killing out of Catastrophe. Is global warming threatening your water supply through drought or by melting the glaciers that provide it? Multinational corporations are happy to privatize your water and sell it to those who can afford it. Has your country been struck by a devastating earthquake? Well, let’s “build it back better” (as Bill Clinton claimed after the 2010 Haiti earthquake) by taking over your home grown industries with global corporations paying a wage of $5 dollars or less a day. Or maybe your community is falling apart under the steamrollers of poverty and the war on drugs? There’s a private prison cell you can go back to after working for free for major corporations like Microsoft in your prison factory. In Disaster Capitalism, Antony Loewenstein talks to immigrants stuck in limbo in Britain and visits immigration centers in America. He maps the secret networks formed to help cor­porations bleed whatever profits they can from economic crisis. He debates with Western contractors in Afghanistan, meets the locals in post-earthquake Haiti, and in Greece finds a country at the mercy of vulture profiteers. Loewenstein is a Middle East based, Australian freelance journalist, author, documentarian and blogger. A columnist for The Guardian, he has written for the New York Times, Washington Post, Counterpunch and many other publications. His best-selling book on the Israel/Palestine conflict was My Israel Question and he is the author of another best seller, Profits of Doom. He’s also contributor to several books of essays. Disaster Capitalism is being made into a documentary film. “Disaster Capitalism” Teaser from Thor Neureiter on Vimeo.